October Ogre by Ron Roy. A Calendar Mystery Book. Review: Do you like a spooky, suspenseful story that is just right for Halloween season? If so, then Calendar Mysteries: October Ogre by Ron Roy is just right for you. It is a great mystery that will keep you on the edge of your seat. You'll also be frightened with scary ogres, witches, and ghosts. Take a frightening adventure with Bradley, Brian, Nate, and Lucy, four friends that go to a hotel that has been transformed into a haunted house for Halloween. They have to try to take a candy basket that is protected with spooky things. If they do so, they'll get a special prize. They have noticed that every child that goes in does not come out. This gets Nate really frightened. They enter the haunted house and follow the green footprints that the ogre at the entrance tells them. They decide to spit up into pairs and see if they find the candy. Soon Brian disappears and the rest of the kids get scared. Will they ever find their friend and get out of this house? 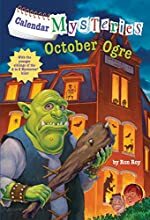 I recommend Calendar Mysteries: October Ogre for kids 6-8 years old because the story is not intended to scare you in any way. It's written so that you could be on the edge of your seat wondering what will come next. It is also a short seventy-page book that is perfect for new chapter book readers. This book has some funny parts and suspenseful parts that get you wondering, Where did he go? It is a great book that I would recommend to any person that loves a good mystery. If your looking for a interesting mystery than check out Calendar Mysteries: October Ogre by Ron Roy today! Review written by Christian (6th grade student). We would like to thank Random House for providing a copy of October Ogre for this review. Have you read October Ogre? How would you rate it?